Pradeep Bariya belongs to Banswara city of Rajasthan. After completion of 10th standard, he discontinued his studies because of financial condition of the family. As he has not completed higher studies so he was confused about his future and wanted to do something for his family. One of his friends informed him about vocational courses at Don Bosco Tech (Banswara) training centre. He visited the centre to know more about the course and its entitlements. 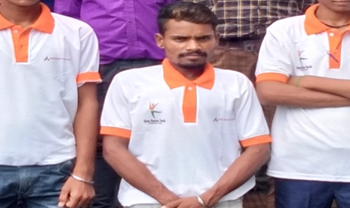 After counseling, he enrolled in Assistant Electrician Domain as per his curiosity.He was one of the ambitious and regular students at the centre. He was always willing to learn new things from the trainers. The training program helped him to gain new dimension in life. He always engaged in all activities with an approach. Now he looked life in a very different and positive manner. After completing the training program, he got a chance to be interviewed in Chatak Electricals Shop. He got selected and getting a handsome salary. Being successful in his career, he shared that Don Bosco Tech changed his life, and is feeling lucky to get associate with Don Bosco Tech Society.